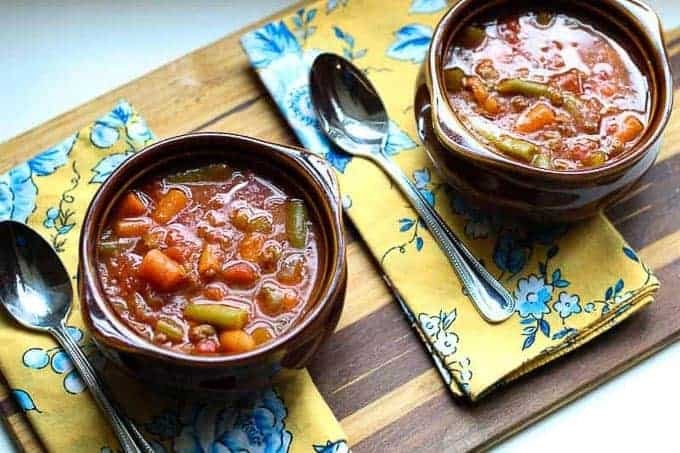 This is an easy, delicious, healthy low-carb Hamburger Soup Recipe. It will become your favorite hearty, go-to soup! 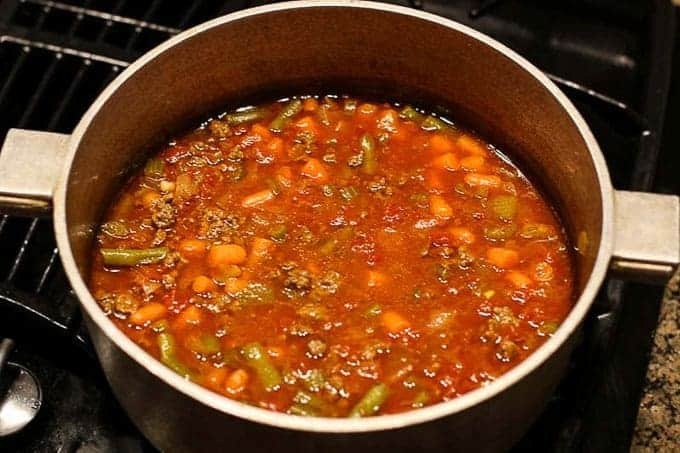 This Hamburger Soup Recipe is hearty, healthy, tasty, and super easy. This is a great recipe to for busy weeknights that will make your whole family happy. The weeknights can get soooo busy. It is sometimes hard to come up with a recipe that is easy, healthy, and a meal that everyone can agree on. BUT everyone in my house LOVES this Hamburger Soup Recipe. This vegetable and beef soup is full of flavor, and warm and cozy for comfort. You will be making this soup again and again. It freezes well also. I often make a huge batch and freeze leftovers to pull out for another night. Hope you love it also! Another great thing about this soup is you make everything in one pot! for my tomatoes. Pomi tomatoes have the most fresh garden flavor you can buy. They literally taste like you hand picked the tomatoes out of the garden and chopped them up to cook with. I am addicted to them. They really help bring flavors to a dish, but you can add your favorite tomatoes and it will still be AMAZING! Let it cook for about 2 hours while you are getting other things done and BAMB!! 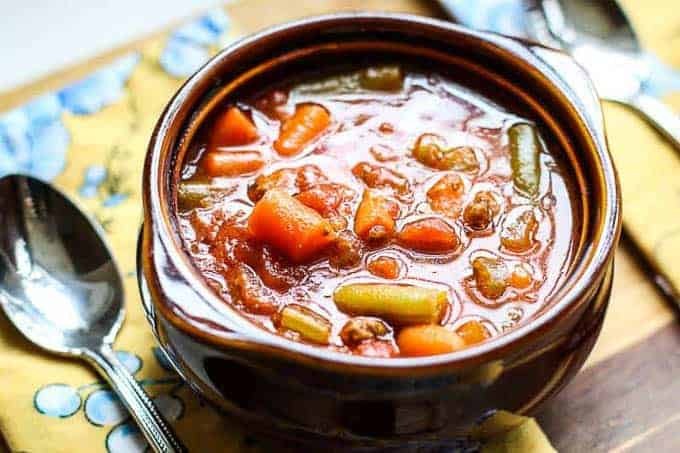 You now have an incredible low carb hamburger soup! *Note: I like the carrots in my soup, but if you want to cut additional carbs, you can take those out. Also, radishes are great to add in if you want that potato taste that traditional hamburger soup recipes have! For other great easy recipes, check out: Paleo Bison, Bacon, and Pot Roast Chili , French Onion Chicken Noodle Casserole, and Crock-Pot Pepperoncini Pot Roast Recipe. Brown ground beef, onions, and celery until completely cooked. Lower temperature to a simmer and cook for two hours. Thank You Cheyanne for sharing! I am so glad you enjoyed it! Thank you for taking the time out to let me know. I made it! ? ?‍♀️ Added extra veggies and used bone broth no bay leaf but still awesome! It was a hit my family loved it!! Thanks for sharing!! Thank you for the recipe. I left out the carrots and added raddishes to mine. I have it simmering right now. It looks and smells delicious! Getting everything to make it tonight!! There used to be a restaurant that made it and I loved it!! Hope mine turns out just as good. Family has never had it before. Thank You!! This hamburger soup recipe has made me so hungry because it looks and sounds so good. I can’t wait to try my hand at making it. I am really a horrible cook, but am hoping mine turns out as good as your photo looks. This looks delicious! It reminds me of my grandma’s goulash! Oh yeah! 2 of my favorite things…hamburgers AND soup! I’m sure I’d have no problem getting my kids to eat this! Mmmm…my taste buds are watering! I love soups, of all types. This one looks so good I almost ate the pictures! Oh I am most definitely craving this now. It’s a rainy day and I feel like this would totally hit home for me today. Soups are great to make during this rainy chilly weather. This looks easy to make and yummy also. We love soup here! This not looks good, but healthy. I’ll have to try and whip this up! I actually ate a can of this recently and was thinking, how great it was and would have loved to make my own, and here’s the recipe. Thank you. Now I will be making my own instead of buying it. Yummy! I love a good soup. This soup looks so good. This soup looks so flavorful and satisfying. I love trying new soup recipes and this looks like a winner. This is making me very hungry. I love soups, I love hamburgers, and I love hamburger soup. I’ve always wanted to make it but never have. I need to try it! This looks delicious and I would totally make it on a cold day — like today! YUMMY!! This looks delicious. It also looks like something my family would love. I am definitely making this. Katie, Great job! This looks like my Moms veggie soup. I have added to it over the years, my base is Zing Zang, V8 and beef broth. So yummy! Oh and don’t forget the ground hot sausage. Is there something I can use instead of ketchup? Tomatoe paste? Looks delicious! This is my kinda soup – straight up comfort food for these cold winter days! This looks so good Katie!! Right up my alley!! !